The lovely pair behind the Northern Michigan lifestyle blog, Life and Whim, (who's other endeavor Harrington used to be my full-time gig), asked me to lend some Upper Peninsula insight in the form of a guest post! I gladly dove in to my favorite places, childhood memories and painting supplies to craft this post titled, An Alleged Yooper Explains How to Spend 72 Amazing Hours in the Upper Peninsula. 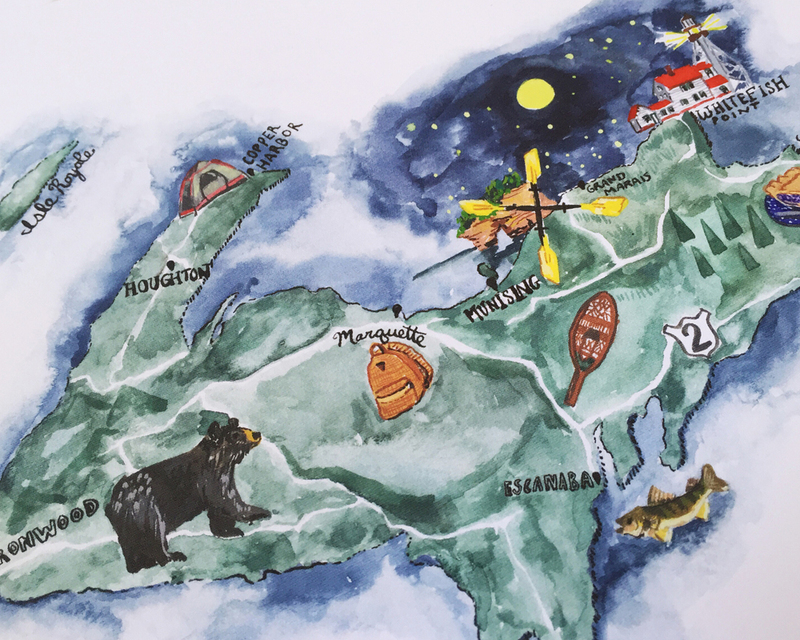 To accompany the post I decided to create an illustrated map of the Upper Peninsula, highlighting many of the places and things I mention in the post. It's now available on Etsy as an 11x14 or 8x10 print! Thanks for reading and I hope you enjoy this snapshot of one of my favorite places on earth! Erin and Craig were in the early stages of planning a Key West destination wedding when Erin reached out to me to create their wedding stationery and their celebration day is finally here! This was one of my favorite projects of last year and I've been anticipating this post for months. Huge congrats and gratitude to Erin and Craig for embracing creativity and whimsy in their invitations. Watercolor florals and tropical foliage illustrations to match the lively celebration, as well as brushy hand-lettering were the focus of our early brainstorms, which opened up a lot of room for creativity across the pieces of the wedding suite. The wedding in Key West was to be a fun, party atmosphere so it was important that the invitations tempt the invitees with a get-a-way with friends and family full of piña coladas, sunshine and revelry. Creating the elements for this set of stationery included many sessions of watercolor painting and pages of lettering. The colorful palette of bright aqua, pinks, yellows, orange and mint was incredibly fun to paint with. I wanted the flowers to be playful and suggestive, rather than overt renderings of tropical foliage like hibiscus and orchids, and the style came together rather quickly once my painting started to take shape. If you're interested in working together to create beautiful celebratory stationery, please get in touch directly via email at brittany@twoifbyseastudios.com or submit this Wedding Inquiry Form! Taking the hand-painted elements into a pattern design merged my passion for stationery and pattern for a vivid complement to the invitation, which is also available on Spoonflower as wrapping paper, fabric and wallpaper! Click here to check that out! In so many parts of life, "old" is such a negative descriptor, but does it have to be? In an age of fast everything, technology updating every minute, and instantly published trends – items mature and become outdated within moments of being created. At least it can feel that way... especially to the makers. As an artist and designer, I have files full of small icons, sketches and lettering that has been scanned or created that no one ever sees. I used to see these as "old," but I'm trying to shift my perspective and view these small pieces of bigger projects as little treasures that have potential to have other lives. Often, on their own, they are just as interesting as in a pattern or design! To put these out into the world, rather than keep them in folders on my computer, I started posting one a day on my Instagram and Tumblr using the hashtag #100daysofdesignbreaks. The icons are mixed in with my sketches and other posts, but I'm happy that they are published and hopefully inspiring others now rather than just in my digital archives. Perhaps you have possessions, ideas or work that could inspire you that you've forgotten about as well? It might be uncomfortable to share these things, but it also might be a path to new ideas! 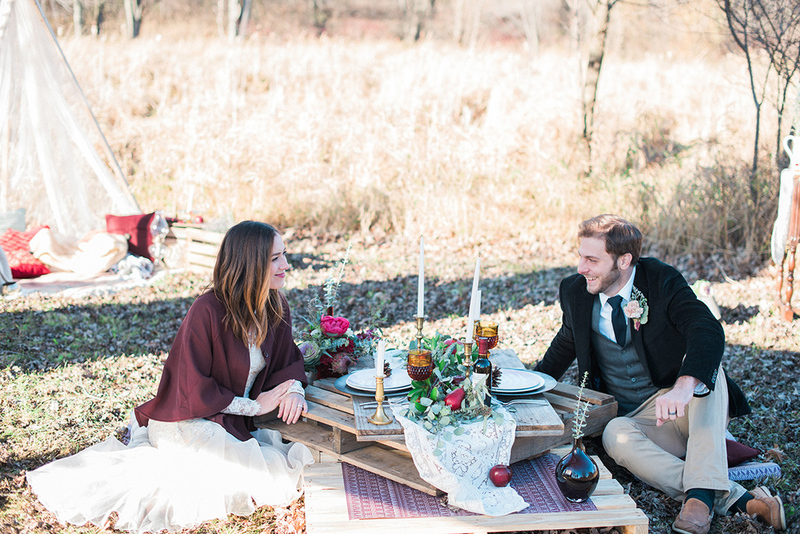 In November a group of pure and simple, amazing creative talent came together for a styled wedding shoot. The outcome was bohemian, rustic, vintage and just beautiful. 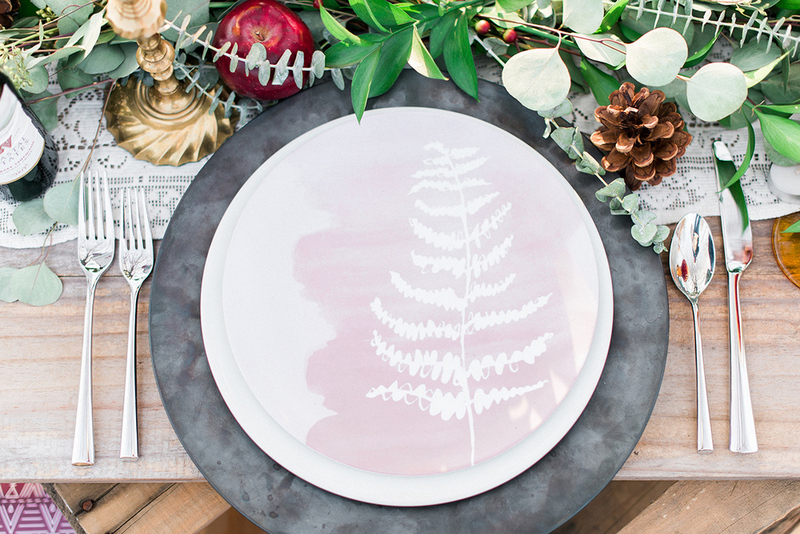 I designed plates with a blush, watercolor fern design and a geometric patterned paper to coordinate with their rich gold and burgundy palette. I can't get over how perfect of a day and setting they had – that golden sunlight is a rarity most Michigan November days. 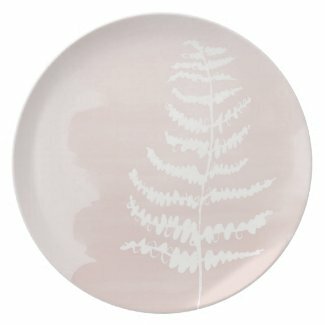 The plates I designed are available for purchase on Zazzle! You can find the link to them below or on my Shop page. The patterned paper is available upon request and hopefully coming to my Etsy shop soon! I've teamed up with Yen Azzaro of Chin-Azzaro in Ypsilanti, Michigan to dream up a pop-up holiday shop and fundraiser to benefit a local non-profit, 826Michigan. The event will take place at Chin-Azzaro (9 S. Washington Street, Ypsilanti, Michigan) on December 12th from 10 am - 6 pm and Sunday, December 13th from 11 am - 4 pm. I'll have gift wraps, gift tags, embroidered watercolor original pieces and silky, modal scarves. When I envisioned the concept for Wares on Washington my intention was bringing community members into a shopping experience where purchasing original art becomes more attainable. I have sold my own artwork since I was 16 years old, but I remember the excitement and palpability of my first purchase of a small 8 x 10 inch painting and realizing the immense value of supporting artists in that way. With Wares on Washington I hope to cultivate that fervor in others. This passion combined with my ever-present desire to use art as a means to fundraise for local organizations was the ultimate catalyst for the Wares on Washington event. I hope to introduce some incredibly talented SE Michigan artists and designers that aren’t typically part of the area craft fair scenes, but that are internationally known! I believe the welcoming, holiday shop setting will be the perfect environment to achieve this combined mission of giving and creativity. A big thank you to all the contributing artists and designers for jumping on board this concept early on. If you aren't in Southeast Michigan, please take a few minutes to check out some of these amazing artists (many have online shops! ): Naomi Ernest, Kelly Ventura, Jocelyn Edin of Garden of Edin, Snow + Ivy, Detroit Card Co., Fineberg Art Studios, Just Curious & Co, and The Home Ground. I just finished this personal project that is pretty dissimilar from any I have ever done. This 12-inch embroidery hoop full of stitches has taught me so much. It taught my hands how to keep stitches even. It taught me how an impulsive, limited palette can be so refined and beautiful. And it taught me that learning about a new craft can inspire new ideas, and thus new work. Seek small, daily creative acts. This is the statement I have come back to over and over again as I work on my sketchbook (though not as often as I would like), as I evaluate whether my daily work is fulfilling, and while I try hard to stay motivated and inspired. I think Grace Bonney said it best in her 100th episode of the After the Jump podcast where she talked about how continuing to grow and learn gives you the chance to fail again. "I think we learn more when we're not best at something and when we're not the tip top of our game. And when we're uncomfortable we learn a lot about ourselves. When you introduce something totally new and foreign to your mind and to your hands hands, it lets you rediscover just how much room you have to grow and change. It also lets you learn another valuable lesson, which is there is never only one right way to do something. The best solutions sometimes come when something doesn't go as expected." Thanks to all my new readers for following along on my journey. All your comments on my halfway point post were incredibly uplifting. If you're interested in learning more about my embroidery project, you can see a lot of the 100 stitches up close with descriptions under the hashtag #100daysoftinystitches on Instagram.